Could we do an experiment along the lines of what Frodo did for spotting and camo to see what effect that equipment has and then that could be used in Armour Inspector? Anyone got any thoughts on how to test this? Lets look at what the description says for the Enhanced Armor. Strenghtens vehicle armor by %4. Strenghtening can mean two things for armor; the effectiveness of the armor or its thickness. To find out which outcome is the correct one we use Triple Overmatch rule. This rule states that if a guns caliber is three times or more than the thickness of an armor plate, it penetrates regardless of angle as long as the ammunition is AP or APCR. All you need to do is to take a Panther and an ISU-152 into a training room. Panthers side hull armor is 50mm. If ISU-152 can penetrate the side hull armor of a side scraping Panther tank, the first outcome is correct. If it cannot, the latter outcome is. The overmatch rule has been tested and proven not to work. I also think WG did say that thickness calculations are not effected. 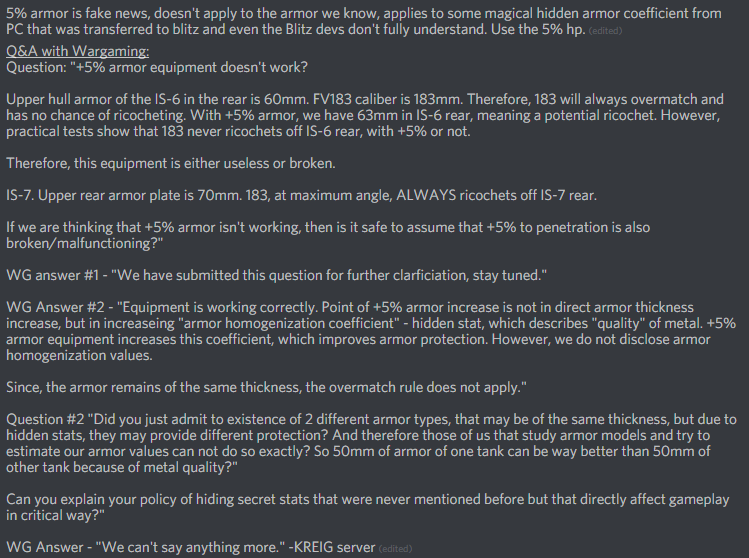 The armor being thicker has been ruled out. It changes “armor quality” This was added to cover the different materials armor is constructed with in reallife. 50mm of mild steel is not the same as 50mm of cast iron. This lead to too much difficulties in balancing in game and was changed to a set number and thicknesses adjusted instead. The problem with testing is getting the data. There is no indicator that differentiates rng or enhanced armor bouncing the shot. Its a wild card and is simply too hard to test and bring back conclusive numbers that can be replicated. that was already tested. It doesn’t change anything to the overmatch 3x caliber rule. i would fully agree to test this once for all so it can be implemented. the #1 ain’t much, there were at least one documented interview, there is the in game description, and . What else ? If u can search the inter webs and particularily if anyone has some Russian abilities ? Then findings are to be reported here. the #2 is more like retro engineering. how about HE splash dmg ? how about pen chances at 99.99% chances of pen ? how about pen chances at 50% pen chances ? did I forget rules ? once we listed everything we know , then we can start testing them one by one. the so called armor homogenization factor or whatever they called it has appretntly use in warthunder. how it leaped into blitz we might never know. This factor had never been mentionned anywhere and someday a dev said it exists in the game. lr is it variable numbers for each tank ? that’s difficult to test. is it 1,00 for everyone and 1,04 for people with the equipment ? That is testable. It will be some man-hour for sure. it doesn't influence the amor thickness, only the penetration factor, which is called homogenisation factor, claimed to be emulating quality of the steel, and ultimately affecting the RNG. so when a round penetration is about the same as the other tank amor, the actual thickness used is 5% thicker. but when other mechanics apply, like overmatch and autobounces, then the thickness isn't actually changed. likewise it (supposedly, since its not really public) wouldn't absorb more damage out of a HE splash, but it might prevent the HE from penetrating. so it typically only applies when you drive to a kuromorimine and shoot him in the face and it bounces. this has been leaked in a dev interview, detailed (sort of) and discussed in unkindest thread. I'm too lazy to reference here. so in your mention of a side scrapping position, abusing the auto bounce, the 5% doesn't change anything. the opportunity to bounce a single shot however, represents in most cases more HP saved than a 5% hp increased. Homogenization is indeed one of the hidden parameters of armor. However, we would like to point out that the absolute majority of our vehicles in game has homogenization parameter equal to 1, and that in no way affects the armor of vehicles. But there are tanks (including some premium ones) for which this coefficient might have different values. This is due to the fact that the first branches and some old premium tanks were adjusted without changing the parameters of armor, that was the legacy from PC tanks. Therefore, at that time it was decided not to correct homogenization coefficient, in order not to change the armor values. I would also like to add, that we have other hidden parameters (cross-country ability, dispersion upon turret traverse), which are not shown anywhere, but affect the performance characteristics of tanks. Whenever we change those parameters (including homogenization) we do report this in all our official sources, because it is a direct change in the performance characteristics of vehicles. Edited by The_Mighty_Wombat, 15 April 2019 - 09:56 PM. Mighty wombat, mightier than ever ! well I had not read it in a long time and it just confirms that this quote is highly confusing. Can’t beat it. i think the retro engineering method is the best option. I think its very hard to test and confirm numbers are due to this and not rng deviation. 4% is 4 shots in 100 and many factors can also effect these 100 shots. But I can help try and confirm numbers from testing. You mentioned war thunder also uses this modifier. I found a reference to a possible calculation which could be included in your test. I dont think Over matching will work as it was tried before and found it works off base armor numbers without multiplier. Can always test it again to confirm. To have a better statistics than the 4% change due to armour enhancement you should roughly compare 1000 experiments with to the same amount without enhancement. Ok, maybe 10 only if you are working in finance evaluation. Would the hitskin be affected by this 4% ? This could be easier to visualise. No way of telling what it will do from game to game...you might test it in a training room, then ingame it could be completely different. I_FOUGHT_THE_LAW Please Keep you’re rigging non-sense to the appropriate threads please, this is about trying to do something useful and constructive for the players. The homogenisation factor can vary by tank, which adds another unknown, cracking. See ? There are many things to test. Though i don’t think hitskin is updated. btw they tested a major hitskin overhaul. Might come to the game any moment now. The guy who tested this is named __crusader6__ he is as reliable as can be. Homogenization was used on PC in the early days, then was deleted for a reason I can’t remember. This “armor quality” was a hidden stat, but most likely varied between 100 and 120 for all tanks, I suspect we have something similar in Blitz. Armor quality didn’t affect HE splash or overmatch, only penetration chances. Edited by romsitsa, 16 April 2019 - 09:48 AM. all what u have said, I have heard it before. however, we need official sources or it’s wortheless. i think we have the opportunity in this thread to build some close understanding of how enhanced armor works, or at least of its results, if we push it. I would love to have the enhanced armor equipment in armor inspector, because most tanks have it mounted, which makes most visualization in armor inspector (or any other service) false. @minitelrose I know a new hitskin scheme has been tested. If you remember too, the conclusion was that WG was not ready to introduce it as opposed to the reduced rng on pen. Edited by I_Fought_the_Law, 16 April 2019 - 05:56 PM. It looks like the only “official” info is that posted by Wombat which doesn’t help much, most tanks could mean 99%, 95% or even 80% or anything really have a value of 1. We’ve no way of knowing if the starting point is 1, 0.9,1.1 or any other value on any tank, then we have 15% RNG, the pen decrease with distance to account for too is there data available for the latter so we can create the experiments to exclude it? don’t bother with the value per tank. I prefer to think it’s not there. One of the reasons for this is that we will never know, and the other reason is that if they want to help a tank become stronk, they can just buff the front plate by how much they want. Why would they pretend the tank has crap armor and then make it invincible through hidden means ? They don’t need to use the backdoor, and it’s not a simulation like warthunder where thicknesses need to be historical and then hardness (or whatever factor to compensate for real life metallurgy physical proprperties) also needs to be historical. We should just test what the pen% are over a series of shots with and without the equipments. we can then set up the perfect case in a training room, shoot 100 times with ultra fast gun or maybe multiple tanks or players. E25 can do the job. but replays and then mapinspector /armor inspector will make sure that the shots were correctly set up.